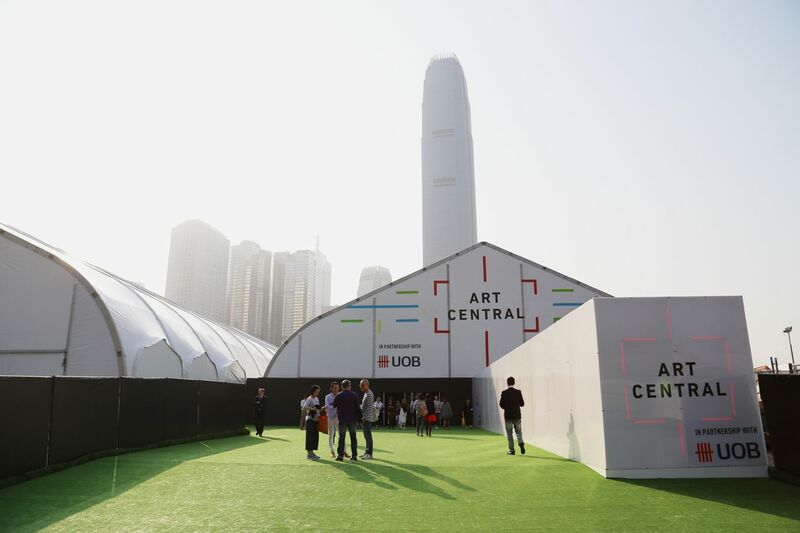 Art Central is like Art Basel’s slightly younger, hipper sister. The artwork is a bit edgier, the atmosphere more informal, the crowd a little younger. Sharavari is an interactive sound installation by London-based, Japanese artist Yuri Suzuki. 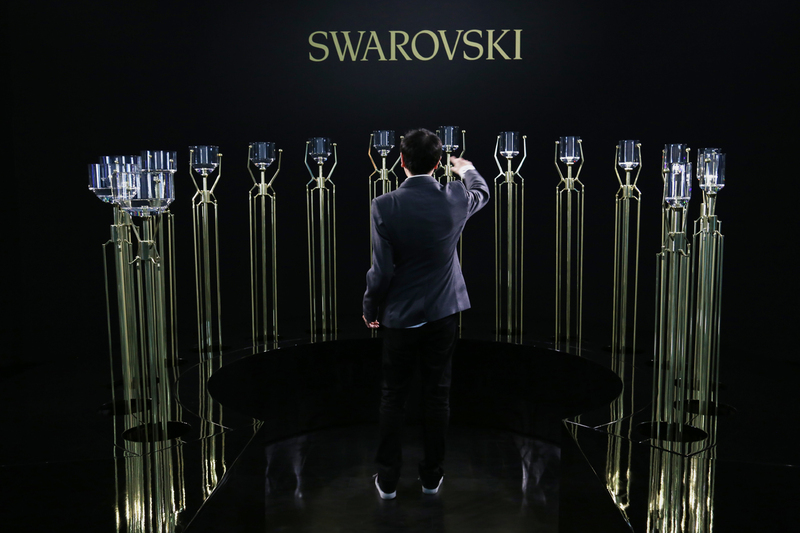 The piece (sponsored by Swarovski) explores crystal as an acoustic material while weaving together music and technology. The instrument uses 16 brass mechanical structures as ‘notes,’ each one featuring a crystal form. When brass hammers hit the crystal, the vibrations turn into sound. Suzuki’s own compositions fill the air but audiences an also play songs with their hands through a network of sensors. 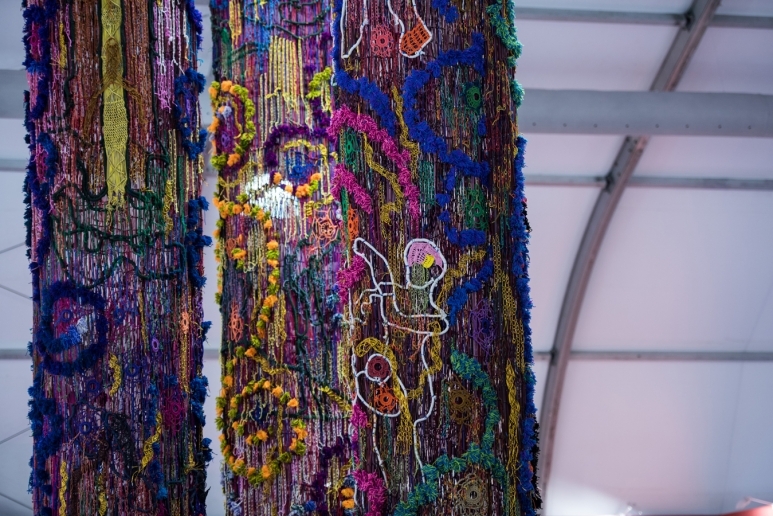 If you see three giant, hand-woven works hanging from the ceiling, each a cacophony of colours, threads and ropes— these are the eye-popping works of Thai artist Santi Wangchuan. Presented by Singaporean gallery Yeo Workshop, the pieces form an homage to Wangchuan’s hometown. Using mixed media and antique weaving tools, the artist reproduces the skills he learned as a child, preserving an art technique that’s set to disappear in the face of rapid urbanisation. 3. The Red Chador: Ban Me! Art as provocative catalyst is the underlining concept behind the interdisciplinary performance The Red Chador: Ban Me!, by Cambodian-American artist Anida Yoeu Ali. 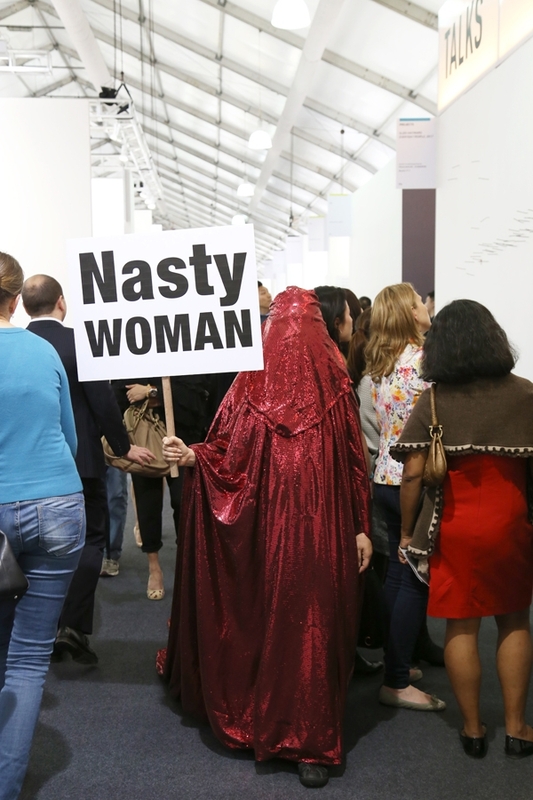 The work sees Ali walk through the fair wearing a sparkly red chador, carrying protest signs (99 in total) that aim to provoke ideas of otherness and fear, but also question democracy, civil participation and public complicity. Previously performed in Europe, this iteration of The Red Chador at Art Central wants you, the public, to sign up for Ali’s “art” tours, becoming participants in her protests. Hipper-than-thou Hong Kong gallery Over the Influence is at Art Central with a series of works by Jerkface, a New York based artist most widely recognised for his playful re-imagination of pop culture iconography. An example? 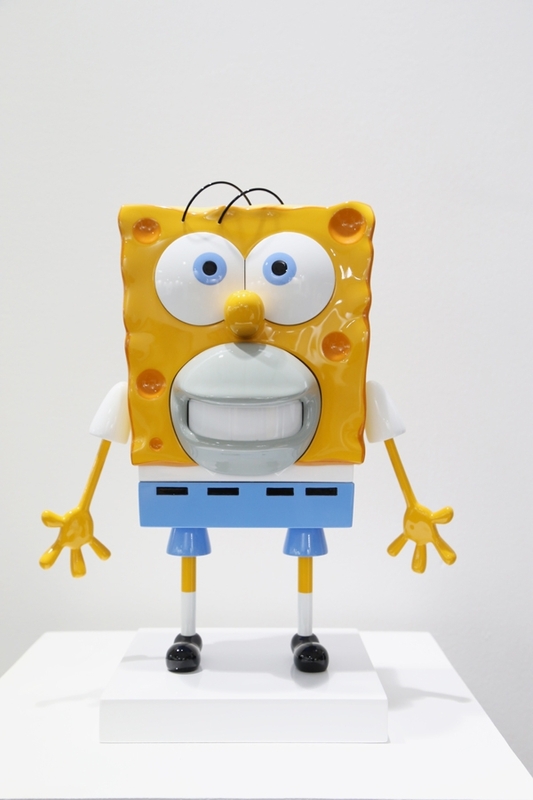 Wacky hybrid sculptures of Sponge Bob and Homer Simpson, or trippy Mickey Mouse canvases we would totally hang in our living room. The artist is doing a series of public murals around town this week (check out Over the Influence for more details), starting with one on Peel Street he unveiled last night. Want to take part in a fake auction-meets-direct selling performance? Check out this work by Uji Handoko Eko Saputro, aka Hahan. 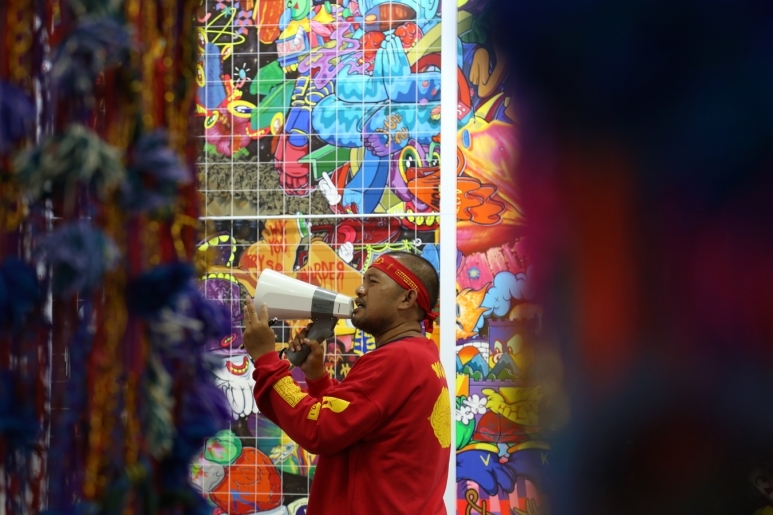 Mixing high and low art and realism with tacky, fictionalised settings, the Indonesian artist interprets the social issues around him in with flippant satire, turning the booth space of the 4A Centre for Contemporary Asian Art into a boisterous auction playground that aims to expose the ironies of the art market. 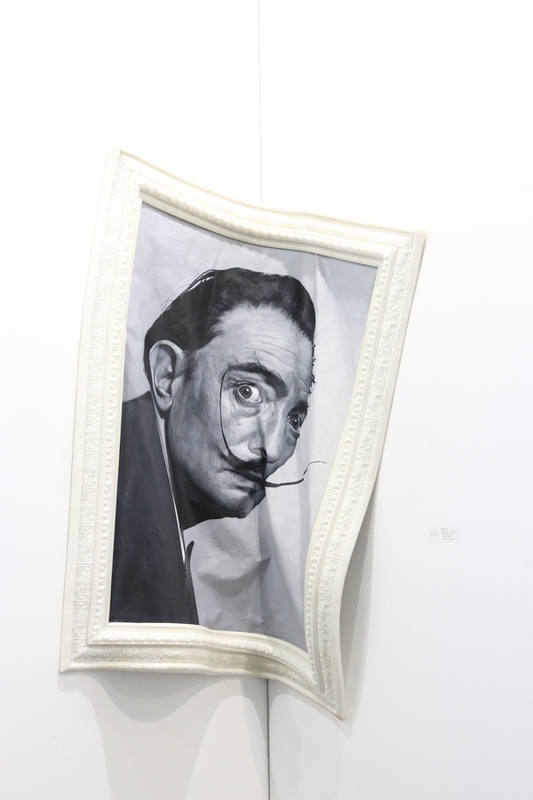 One more rabble-rousing artwork for you—this one by Paris-based Egyptian artist Yves Hayat for Mark Hachem Gallery. 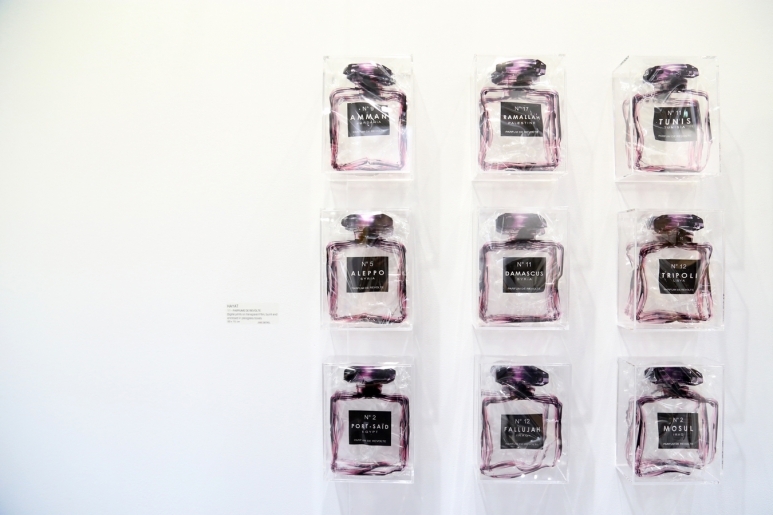 The mixed media piece showcases, as its title suggests, reinvented bottles of Chanel perfume named after war and conflict afflicted cities around the world. We like. 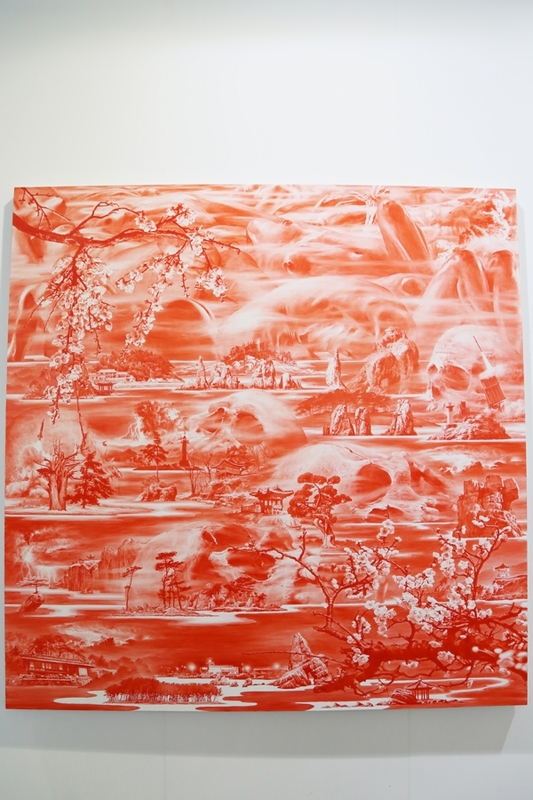 Made of silica and oil on canvas, you’ll be hard pressed not to touch the works of Chinese artist Shen Shaomin, who’s at Art Central with Taiwanese gallery Da Xiang Space. The pieces depict iconic figures—Dali, Yoko Ono, and the like—giving a new perspective on the tradition of portrait-taking. Sea Hyun Lee’s Between Red series, at the Choir & Lager Gallery booth, is overwhelmingly simple at first glance. The landscape paintings show delicate washes of crimson and large swathes of white, rendered in a purposefully fragmented and seemingly flawless way. Look again, however, and you’ll start noticing a second, less idyllic layer of skulls, body parts and inconsistencies hidden behind the mountains and trees. It is this uncanny duality that makes Lee’s work compelling—both on a conceptual and aesthetic level. 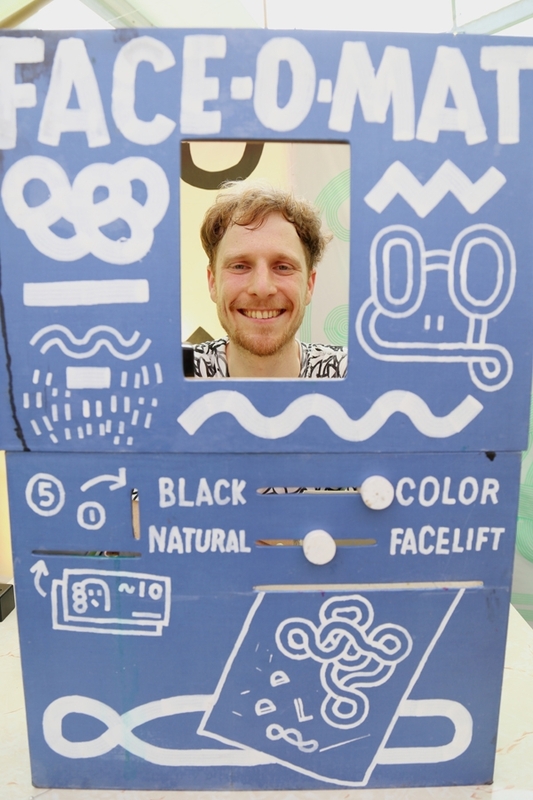 For two hours each day (and for a mere HK$50), Swiss artist Tobias Gutmann is taking interpretative portraits of the fair’s visitors in his Face-o-Mat, an analog drawing machine that ‘prints’ (read: Gutmann personally depicts what he sees in your expression) colourful and quirky sketches of abstract faces. It’s adorable, fun, and you get to take the final portrait home. We love it. Photography by Michaela Giles/Hong Kong Tatler.